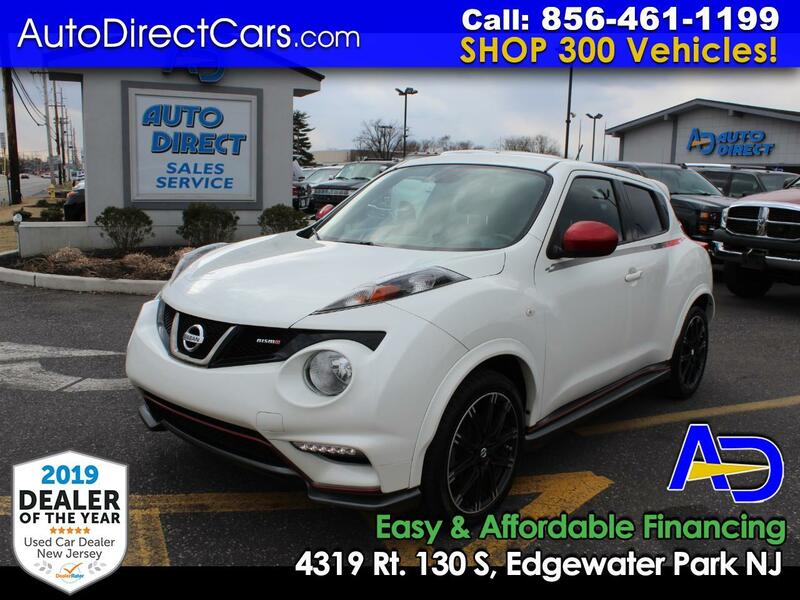 AUTO DIRECT #1 RATED DEALERSHIP $2K DN/ $199 MO NISMO EDITION JUKE SPORT LOADED WITH NAV 35K MILES! ***RARE FIND NISMO EDITION JUKE SPORT 5 DR HATCHBACK 4CYL TURBO ONLY 35K MILES BEAUTIFUL CONDITION*****BUY WITH CONFIDENCE FROM NEW JERSEY'S #1 RATED PRE-OWNED DEALERSHIP. CHECK OUT THIS 2013 NISSAN JUKE NISMO SPORT 4CYL FWD 5-DR HATCHBACK WAGON. CAR FAX CERTIFIED. THIS VEHICLE IS IMMACULATE CONDITION RUNS AND DRIVES PERFECT. LOADED WITH ALL FACTORY OPTIONS FEATURING NAVIGATION, SPORT WHEELS, BACK UP CAMERA, PUSH BUTTON IGNITION, PREMIUM SOUND SYSTEM, POWER LOCKS, POWER WINDOWS AND MORE. 35,375 MILES IN AL ORIGINAL CONDITION DRIVEN APPROXIMATELY 6K MILES PER YEAR. THIS IS A RARE FIND AUTO DIRECT CREAM PUFF. A MUST SEE AND DRIVE TO APPRECIATE THIS TREMENDOUS VALUE. THIS VEHICLE QUALIFIES FOR A PRE-OWNED AUTO DIRECT CERTIFICATION. FINANCING AVAILABLE WITH EASY AND AFFORDABLE PAYMENTS STARTING AT $199 PER MONTH. TRADE INS WELCOME. STOP BY & VISIT OUR HUGE INDOOR SHOWROOM.